Firstly a big thank you to the, very generous, but disappointingly few, donors to the Boza Printer Appeal. The total the last time I looked stood at Tsh 230 000 which is enough for a small printer and a couple of spare ink cartridges. Any further money I receive will go towards ensuring its further use by providing a supply of cartridges which, as in the UK, are expensive. Yes, I’m sorry, everything seems to have worked against me over the last couple of days as far as the Internet is concerned. We were without power yesterday afternoon and then when I arrived at school this morning I found no electricity there either. Mr Mmari had been to investigate and found that one of the locals was trying to lift a broken power cable with a branch to clear a goat that had been electrocuted. It looked as if some of the cable had been stolen. The worldwide high price of copper strikes again. An electrician was sent for, but certainly there was no more power during the day and then to cap it all both my sim cards locked up and would not accept outgoing calls or messages, including use of Internet. There was a real high spot during the day though, or rather two. Outside the classrooms there is a big tree that provides shade for a seat that had been built on its roots. All the forms have weekly tests first thing Monday morning, rotating through the subjects, so with no chance to do any computer work because of the power, I decided to take advantage of this spot to chill out. As the Form IIIs finished their test they were allowed to leave and I slowly gathered a few of them around my perch, where the questions started about the UK and how the environment (their word) differed from Tanzania. Staring out at windowless classrooms, none of which had electric power, surrounded by grazing goats and cows, with a view behind me way down to the Ocean in the distance, where do you start. How do you explain much of the discontent that is seen in many areas of the UK to students who know well that 60% of Tanzanians survive on average earnings of 75p a day. The conversation, or rather question and answer session, continued until Hillaly, who had joined us from Form I asked if I would be in school on Friday. As I have no plans to travel anywhere I said yes, whereupon he asked if I could referee a football game between the Form IV leavers and the rest of the school. Quite a high that they thought me capable but I had to explain that any refereeing I could do would involve a chair in the centre circle and decisions made from 50m distance. (no goal line technology here). The bell went for break soon after, saving further discussion, and they drifted away to the dining room, just as Mr Ntoteli walked up and said “Karibu”. This is a useful word that can mean ‘welcome’ to someone arriving, ‘you’re welcome’ in reply to thanks, an offer of a drink, ‘Karibu Kilimanjaro’ or, as in this case, a welcome to follow him. We walked through the school, out across the road and into an older part of Boza below Mr Mmari’s house. 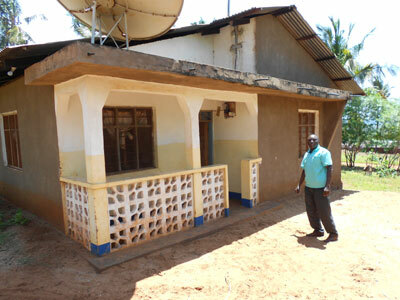 Here Mr Ntoteli had built his own house some years ago and he invited me to warm milk and chapattis . Not usually my choice of mid-morning snack but I was so pleasantly surprised and, to be honest, quite proud, at his offer, that I accepted a very small milk and a delicious chapatti. 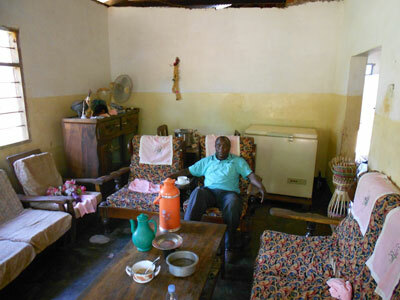 His house had electricity as the freezer along one wall and the TV in the corner gave ample evidence for and as well as the lounge had four bedrooms; no kitchen; cooking, as at Mr Mmari’s, was done outside. The milk came from his herd of ten cows that he milked every morning before school, leaving the milk to be picked up and transported to a farming cooperative in Pangani. 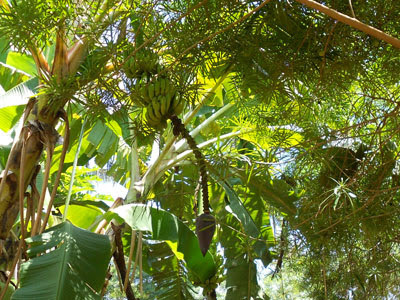 He also had twenty goats whilst his one acre garden sported banana trees and paw-paws. We finished our snack and returned to school in time for period five. Deo and I went for a swim when I got home, but to be honest the breakers were so big that you had to get well past them to be able to really swim and Deo wasn’t really ready for this, so it was a short visit although very cooling. The draughtsi games continued after dinner and having beaten Deo twice with Tanzanian rules and then beaten Denis using the slightly different rules carried in from Uganda, I felt a little less overpowered than I had the previous night and went to bed happy.